Please note that this guide is specifically for MYOB Desktop. Note: Deputy currently integrates with MYOB AccountRight, MYOB AccountRight Live, and MYOB Desktop. This document is specifically for MYOB Desktop. Before you get started, you'll need to make sure that the Employee Time Sheet Export Code matches the Employee Card ID in MYOB. 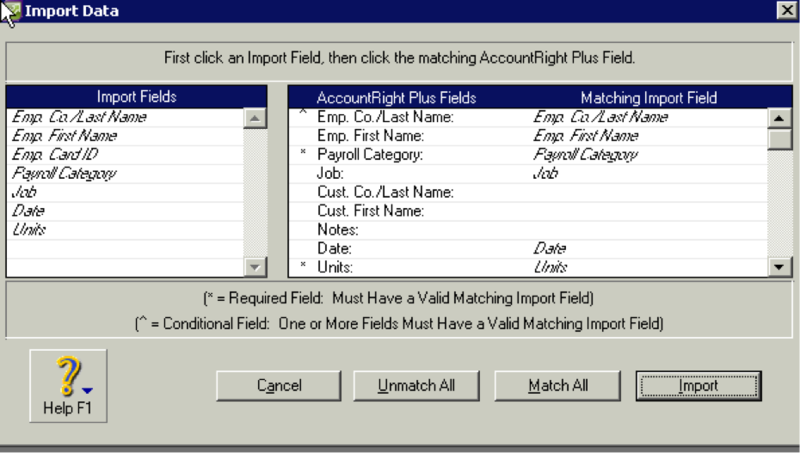 You will also need to check that Employee Names are identical in both systems, and optionally also that the Area Export (Deputy) and Job (MYOB) Codes are the same. You must also ensure that the Leave names in Deputy and MYOB match up. 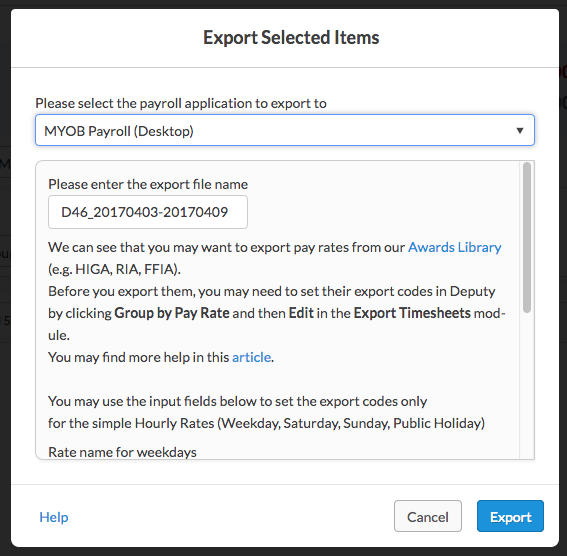 When exporting using our Custom Awards Library, you will need to match the export codes between MYOB and Deputy. 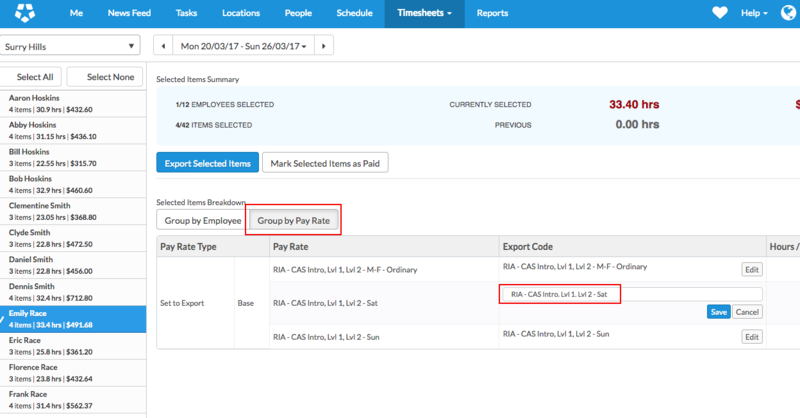 To edit the export codes, simply click 'Group by Pay Rate' when exporting timesheets. You can then edit the entry in the 'Export Code' field. Remember to press 'Save' when you are finished. You may export to any version of MYOB excluding the 'Live' versions (you may, however, export to MYOB AccountRight Live). 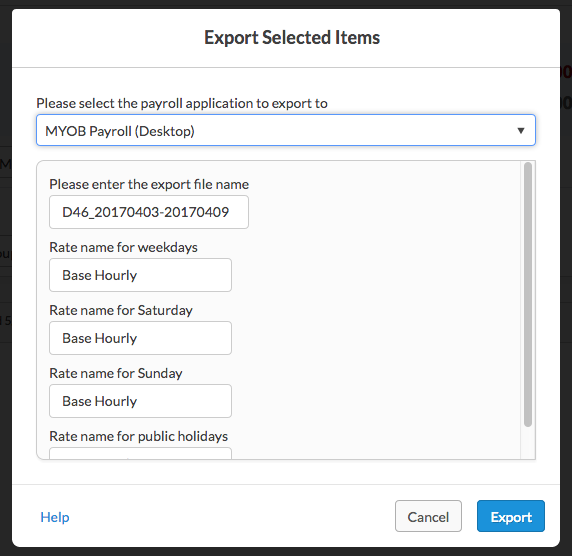 As an example, you may export to MYOB AccountEdge, but not MYOB AccountEdge Live. 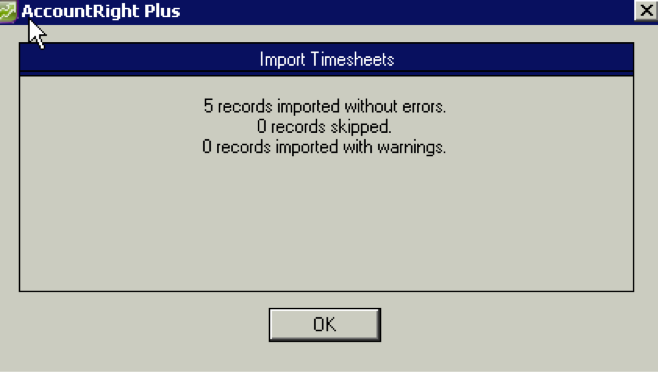 In MYOB, please ensure that the system is set to accept time sheets as an import. You must also check that "Payroll Categories" is set to Base Hourly in MYOB. You may also choose to have custom Saturday, Sunday and Public Holiday rates. Standard Pay Hours must be set to $0.00 in MYOB on each relevant employee’s card. Please also ensure that salary employees are listed as salary and have their standard hours set to the accurate auto-pay amount in MYOB. Finally, please specify the rate names for your Saturday, Sunday and Public Holiday rates. After you are done, click "Export". Please ensure you have pop-ups enabled, as you will be asked to download the timesheet file. By default, this will go to your Downloads folder. Once the file has been successfully exported from Deputy, it can then be imported into MYOB. 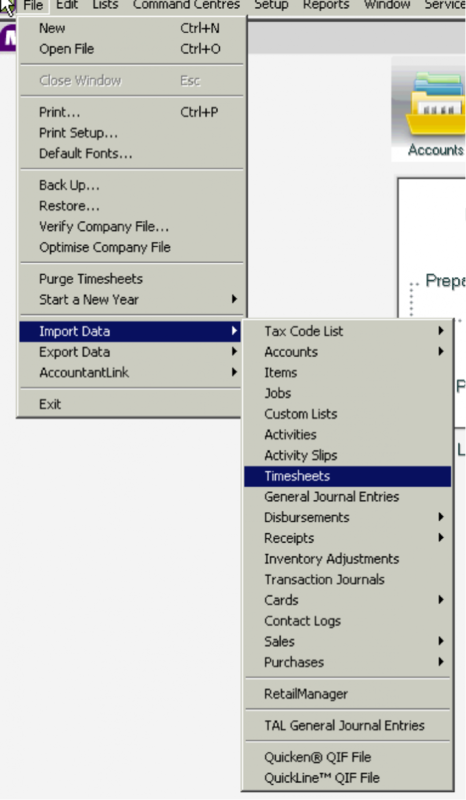 First, please navigate to "File", then "Import Data" and finally to "Timesheets" on the MYOB toolbar. 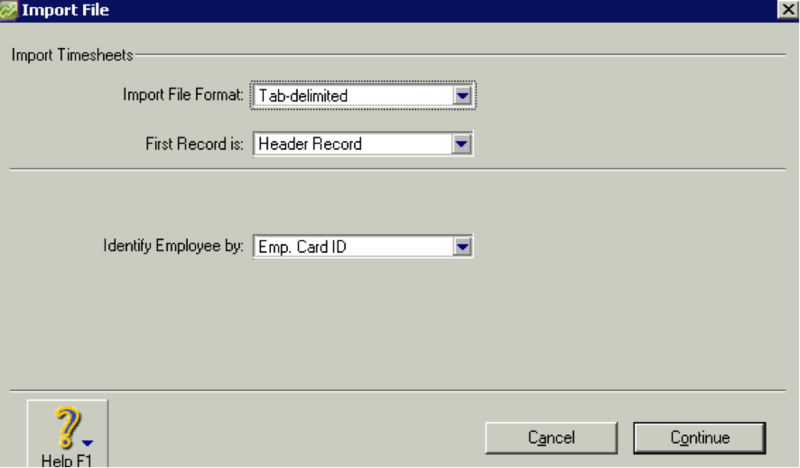 After clicking "Timesheets", please set the "Import File Format" to Tab-delimited, the "First Record" to Header Record, and "Identify Employees" to Employee Card ID, as shown. Next, please click "Continue" and select the file you have just created, which should be a .txt file. 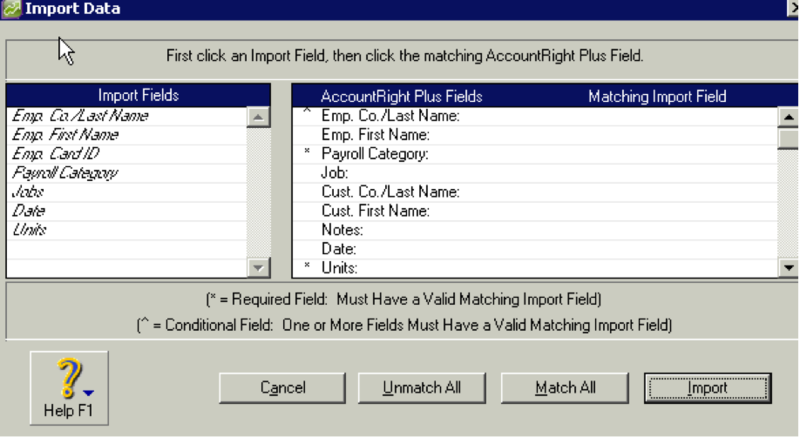 If the fields have been matched correctly, you will see a screen similar to the one below. Please do not use the "Match All" option, as in some cases it will not match correctly. When you have matched the fields, please click "Import". If they were matched correctly and the import was successful, the import screen will look similar to the one below. If you have matched incorrectly, you will receive an error. If this is the case, please match the fields again manually. The imported information will be displayed under "Timesheets" and may now be utilised as usual for processing your pay run. You may adjust "Base Hourly" here to whichever condition is applicable for your employees. You may now follow your usual process for processing time in MYOB. We support our Custom Awards Library with MYOB Desktop. Note: For your employees, you can use both MYOB's base hourly rates and our Custom Awards Library. It will remain as a single export file. 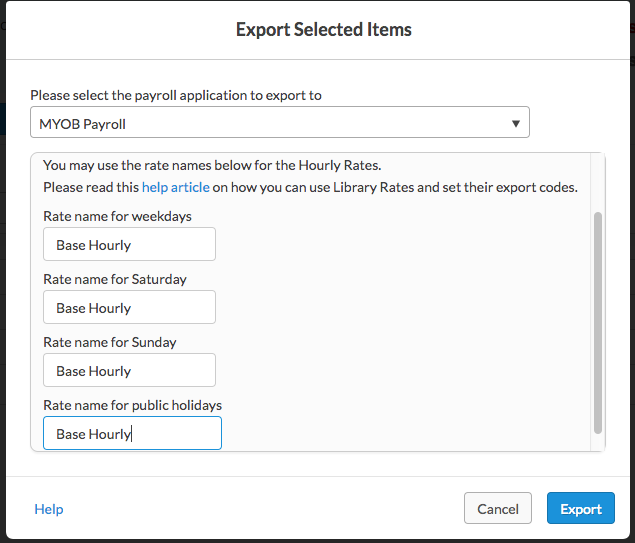 If you export employee timesheets with our Custom Awards Library, you may see the 'Rate Name' fields in the Export modal. If you have employees with the basic standard pay rates (Weekday, Saturday, Sunday and Public Holiday), these fields will appear. Otherwise, these fields will not affect employees using the Custom Awards Library. Note that this has not changed. Much like the above, you will need to navigate to the 'Group by Pay Rate' view switch and edit the export codes there. The codes for the standard pay rates within the export modal will not affect the exported library rates.